From the A35 take the A354 south to Weymouth. 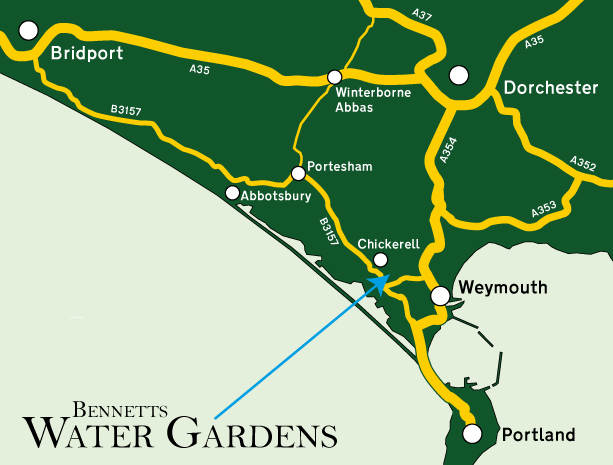 Continue south on A354 towards Portland until you see brown road signs for Water Gardens. Take the B3157 west towards Granby Ind. Estate/Chickerell along Granby Way. At Wessex Roundabout (football stadium) carry straight on to Hampshire Road towards Granby Ind. Estate. At the traffic lights carry straight on towards Chickerell. 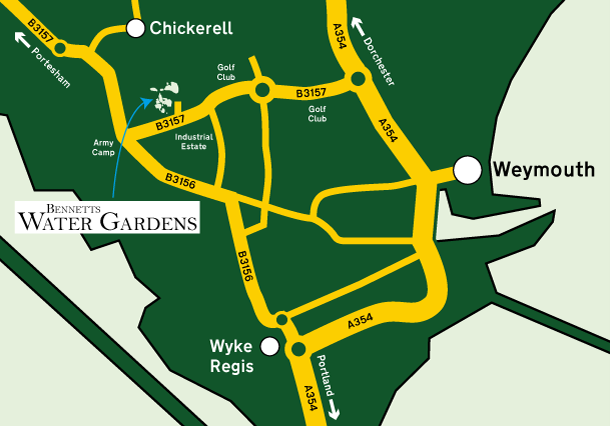 Take the first right into Putton Lane and Bennetts Water Gardens. From the A35 take the B3157 south towards Abbotsbury. Continue along the B3157 through Abbotsbury, Portesham and Chickerell. At the traffic lights turn left towards Weymouth and follow brown road signs for Water Gardens. Take the first left into Putton Lane and Bennetts Water Gardens. Take the A352 west to Wool. Continue on the A352 west to Warmwell, then at the roundabout take the A353 towards Weymouth. Join the A354 towards Weymouth. At Wessex Roundabout (football stadium) carry straight onto Hampshire Road towards Granby Ind. Estate. Turn right into Putton Lane. Take the A354 north to Wyke Reigis, then at the roundabout take the B3156 towards Chickerell. Carry on left through the next set of traffic lights, then carry straight on through the next set of traffic lights towards Chickerell. At the next set of traffic lights turn right on to the the B3157 and follow the brown road signs for Water Gardens. Turn left into Putton Lane. At Winterbourne Abbas turn off the A35 south on to the B3159. Then take Coombe Road south towards Portesham. At Portesham turn left on to the B3157 to Chickerell. Continue on the B3157 to Weymouth. Click here for a more general directions.